Aston Workshop, the owner of the www.astonbespoke.com website, has created this privacy statement in order to demonstrate our deep commitment to the privacy of our site visitors and customers. As a company, we strictly adhere to all industry guidelines and we continually review our policy and procedures to ensure the safety and protection of our visitor and customer information. Aston Workshop has fulfilled the requirements of the 1998 Data Protection Act. 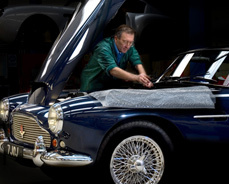 1.1 astonbespoke.com is part of Aston Workshop Limited, and as a company, we are committed to safeguarding the privacy of our website visitors. on our dedicated parts website. Completed examples of our Bespoke models can sometimes be found on our car sales website.